Perhaps the last chance to head off a California gasoline price hike that could exceed 50 cents per gallon by 2020 just was defeated on the state Senate floor. Sen. Andy Vidak, R-Hanford, offered amendments to a bill, AB2492, that had nothing to do with the bill’s focus on drug sentencing. The amendments duplicated those in Vidak’s bill, SB1079, which would head off a gas price hike that could begin next year. “I rise today to offer amendments that will stop a hike in gasoline and diesel prices that could range anywhere from 16 to 76 cents a gallon every time Californians fill up Jan. 1, 2015,” Vidak said on the Senate floor Aug. 21. “Gasoline is not a luxury for most Californians, it’s a necessity. The amendments were promptly voted down by the Senate’s Democratic majority, 23-10, without discussion. SB1079 would exempt the transportation fuel industry from having to comply with the state’s cap-and-trade program, which the industry is scheduled to do beginning Jan. 1, 2015. That program was started to advance compliance with AB32, the California Global Warming Solutions Act of 2006, which was signed into law by then-Gov. Arnold Schwarzenegger. The program requires the state’s largest energy users to reduce their carbon emissions or purchase carbon allowances through the cap-and-trade market mechanism. “The State Air Resources Board’s regulatory analysis for the market-based compliance mechanism anticipates carbon allowance costs ranging from $15 to $75, inclusive, per ton between 2015 and 2020,” the bill states. The bill exempts from the cap-and-trade program any industries not enrolled in it by Dec. 31, 2014. “This act is an urgency statute necessary for the immediate preservation of the public peace, health, or safety within the meaning of Article IV of the Constitution and shall go into immediate effect,” the bill states. Despite the bill’s call for urgency, SB1079 is bottled up – Vidak calls it “stuck” – having been sent to the Senate Rules Committee. A similar bill, AB69, by Assemblyman Henry Perea, D-Fresno, provides a three-year exemption for the transportation fuel industry until 2018. It has been assigned to the Assembly Rules Committee. No one knows exactly how high gas prices might increase as a result of bringing transportation fuels into the cap-and-trade mandate. It will depend on how high the price of a carbon allowance goes. Currently at $11.34 per ton, it’s expected to grow by 5 percent plus inflation per year as the carbon allowance noose tightens. By 2020, gas prices will likely increase in the range of 13-20 cents per gallon, but could exceed 50 cents per gallon, according to a letter to Perea from the Legislative Analyst’s Office. The estimate is based on gas prices increasing 8-9 cents per gallon for every $10 per ton of carbon allowance cost. 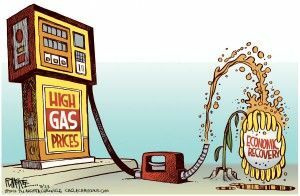 The estimate of a 13-20 cent per gallon gas price rise is based on a June 2014 study conducted for the California Air Resources Board by the Market Simulation Group. It’s based on a 2020 allowance price of $20 per ton. But the study also states that allowance prices could go as high as $79 per ton, shooting gas prices up more than 50 cents per gallon. “This study’s scope is narrower than the others we reviewed, but our summary places very heavy weight on it due to its timing and methodological credibility,” the LAO letter states. The other cost studies that the LAO looked at are not far off from the Market Simulation Group report. A 2012 study by the Boston Consulting Group estimated that gas prices could increase 15-77 cents per gallon in 2020 (in 2013 dollars). The amount could be 17-87 cents per gallon in projected 2020 dollars, according to the LAO. An 88-cent gas price hike would likely push California gas prices over $5 per gallon. And that concerns Perea, who defended his three-year moratorium bill in a press release. The pain at the pump will be felt not only by residents, but by businesses, warned John Kabateck, executive director of the National Federation of Independent Business/CA. Transportation businesses will likely be hardest hit by the gas price hike. “Moving fuels under the cap-and-trade program could stifle the economic recovery in the state and give out-of-state businesses a competitive advantage,” said Mike Kelton, CEO of Inland Star Distribution in Fresno. The probability that SB1079 and AB69 will not be voted on in this legislative session has drawn scorn from Sacramento Bee columnist Dan Walters. He estimates that a 15-cent gas price hike would translate into a $2 billion hit to Californian motorists, with many paying more than $100 extra annually to fill up.